On this all-ages adventure, enjoy game drives in Tanzania's greatest wildlife refuges, ride by tuk-tuk through a Tanzanian village, set out on a family treasure hunt through a local market, and meet with a Maasai village elder. This is a luxury small group safari. 12 people, two land rovers. We spent the arrival night in a hotel in Arusha, two of the nights during the safari in hotels, and the rest of the nights in the luxury camp. The hotels were all good. The food was good, not great. The luxury camp is a two room canvas tent containing a queen size bed or two doubles. then there is a dressing area leading to the "bathroom" which is a toilet seat on a box over a hole in the ground. There is a shower stall in which they fill a canvas bag with hot water from the fire. They will not begrudge you a refill if you want to take your time. The day starts early in the dining tent with breakfast. then it is off to the land rovers to begin the safari. The guides from all the different safari's communicate to share where the most sought after animals are to be found. You will absolutely be up close and personal with lions, elephants, giraffes, monkeys, wildebeest, ostrich, zebra, hyrax, and the bird life. You will also see Water buffallo and hippos, but is best not to get close to them. and you will see plenty of Cheetah and some Rhinos, but usually from afar. Lunch is usually conducted picnic style in the park. Our A&K picnics were the envy of every other group. Then it is touring until sunset. When you get back to camp there is a camp fire going and the head guide will present a lecture, while everyone enjoys some much needed libations, of which there is great variety and unlimited quantity. Then dinner in the dining tent, and after dinner back to the campfire for more libations, and usually to review everyone's pictures from that day. The guides are extremely knowledgeable and friendly. You will actually miss them on your last day. I had a great time and heartily recommend this safari and A&K. The best part is being inside the game park all day and night. You really dont want to be going back to a hotel, but to stay out in nature. Arrive in Arusha and transfer to your accommodations, tucked into the lush acres of its fertile slopes and offering gorgeous vistas. Depending on arrival time, meet your A&K Young Explorers Guide, who will join your group for the journey. This morning, meet the children and staff of Ilboru Primary School, one of the few schools in the region that offers programs for deaf students and children with special needs — a project supported by Abercrombie & Kent Philanthropy. Then, travel overland to small, wildlife-packed Lake Manyara National Park and your newly built luxury lodge nestled on the rim of the Great African Rift Valley, overlooking Lake Manyara. Children may cool off and join the Young Explorers Guide for a swimming competition at the lodge pool. Tonight, gather for a special welcome dinner. Set off on a thrilling morning game drive, where you may spot hippos wallowing along the shore, pelicans scanning the surface, monkeys leaping between the trees and giraffes under the shade of a 1,000-year-old baobab. Return to your lodge for lunch. This afternoon, participate as a family in a cooking demonstration with the on-site chef, and sample the local dishes you create together, during an all-ages Chef’s Table experience. Today, see the local community and nearby rice fields of the village of Mto wa Mbu, as you Ride Like a Local on a tuk-tuk. Then, stroll through the village market, where children go on a treasure hunt, setting out with money and a list of “treasures” to purchase. Afterward, journey to Ngorongoro Crater, stopping en route at Gibb’s Farm for an organic lunch. Proceed to your luxury lodge, situated a 15-minute drive from the Ngorongoro Gate. Once settled in, younger guests can join the Young Explorers Guide for crafts and games, or a dip in the lodge pool. 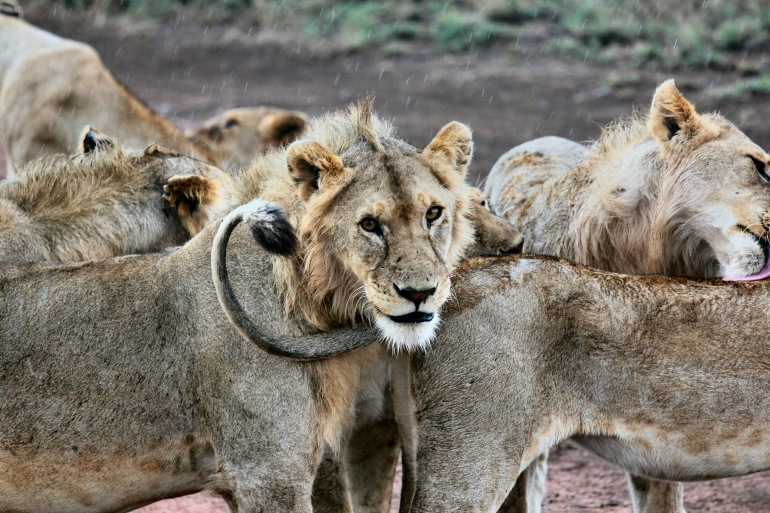 Head into the Ngorongoro Crater, a haven for lions, rhinos, wildebeests, gazelles and many other species. Enjoy a picnic lunch before returning to your lodge later this afternoon. Fly to the Serengeti and settle into your luxurious tented safari camp, where you revel in its unique combination of comfort and exhilarating optional guided game walks, as well as night game drives. Later, take a game drive through the rambling park, site of the Great Migration. Then, as the equatorial sun sinks low on the horizon, gather with your Resident Tour Director for a thirst-quenching Scenic Sundowner. Tonight, relax in your split-level suite tent, enjoying your veranda, bathroom with a soaking tub, separate shower and flush toilet. As the animals begin to stir, set off on a first-light game drive to view the prolific wildlife. You might spot hippos returning to water after foraging for food all night, elephants rustling through trees in search of breakfast, and sated lions, arriving back from a hunt. During the afternoon game drive, families visit the Ololosokwan Maasai tribe on what is sure to be one of the most rewarding experiences of your journey to Africa. Tonight, return to camp for a special farewell dinner in the bush. Fly to Arusha, where you may relax in a dayroom before departing for home. Last group event: hotel transfer at 12:00 p.m. on Day 8. Meals and fully guided sightseeing (including park and entrance fees) as noted in the itinerary. Fly glamorous Emirates to Dubai and check in to your luxury hotel. The next day, discover the best of this dazzling city, viewing its remarkable architecture, visiting the Spice Market and colorful shops at the Deira Gold Souk, and ascending the Burj Khalifa, the world’s tallest skyscraper. On the last day, continue on to your journey or board your flight home. Complimentary Safari Duffel | Guests on this journey receive a custom-crafted A&K safari duffel. Customize This Journey | If you would like to customize this itinerary and create a Tailor Made Journey just for you and your companions.